Honda has just released images of the refreshed Mobilio and Mobilio RS for the Thailand market. The images only reveal changes to the front and side profiles of the car, but we think that the rear-end wouldn't get too many changes in the first place. 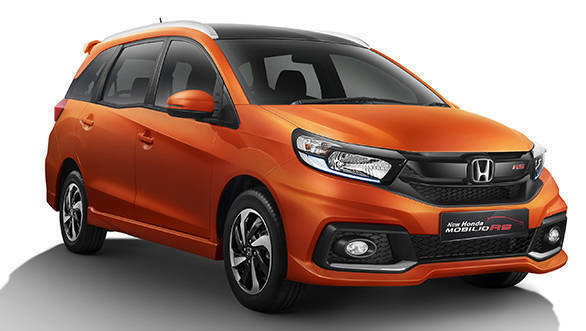 The front of the 2017 Honda Mobilio is completely new with BR-V inspired headlights and a chunky chrome strip  like in the newer Hondas  connecting the headlights. The front bumper is new too, and the bonnet has been revamped to accommodate the new grille and headlights. On the RS variant, the chrome strip on the grille has been painted black, while the bumper with the sporty cuts and fog lamp housings is different too. It also gets the sporty dual-tone wheels like in the current Mobilio RS. The interior of the car, although not unveiled as yet, is expected to get the same update that the facelifted Amaze received in 2016. This means a new instrument cluster, climate control and a more basic two-din infotainment system instead of the earlier difficult-to-use touchscreen system. Mechanically, the only update will be to the gearbox. The petrol variant will now get a CVT instead of the current 5-speed torque converter. The Honda Mobilio has become quite popular in the fleet market, but isn't doing too well among private consumers. However, this update to the Mobilio which is expected here sometime in 2017, should help move things along.